In late-November, Melbourne's southwest scored the perfect balmy weather venue. 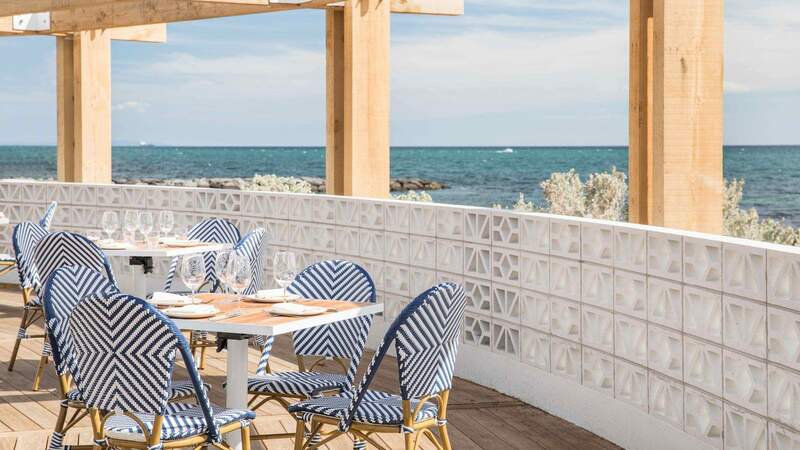 Meet Sebastian, a new Spanish restaurant right on Williamstown beach. After opening the doors to Southbank Argentinian grill Asado in August, co-owner Dave Parker (also one of the names behind San Telmo, Pastuso and Palermo) turned his sights to this project. He teamed up with longtime friend and Williamstown local Alex Brawn to transform the space once home to Shelly's Beach Pavilion into a breezy seaside bar and grill that nods to the Spanish town of San Sebastian. Acclaimed design studio Ewert Leaf transformed the heritage-listed space into a Hamptons-style vision of white, blue and oak befitting of the waves lapping at the shore just beyond it. The venue has space for 250, complete with dining room, bistro and a sprawling shaded deck that is literally on the beach. The all-day menu is available from noon, with lots of snacks, small and large dishes cooked over the charcoal grill and cold smoker. Snack on pinxtos like fried mussels and pork croquettes, or dive into some sardines, house-made sausage or a whole flounder. Meats and fish are cured in-house, too, which you can get into with the kitchen's signature charcuterie board. Patatas bravas make an appearance, thankfully, and Spanish wine, vermouth and sangria on tap will really top off your post-swim feast.